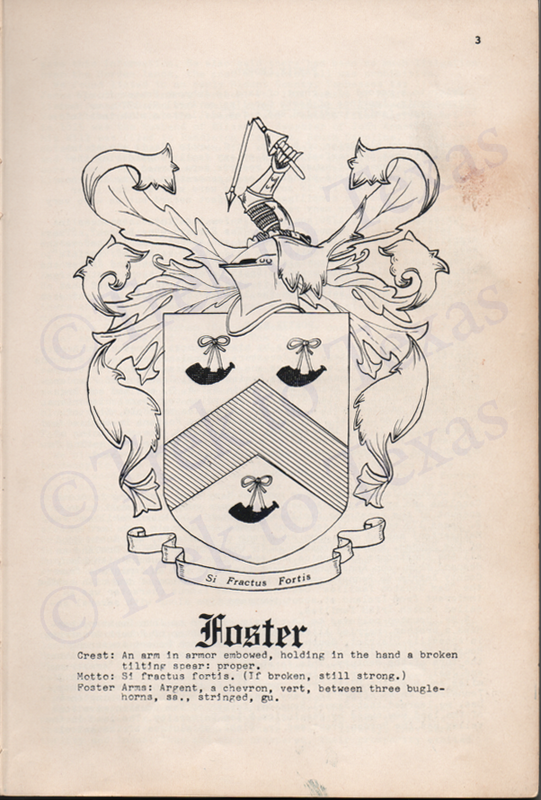 I’m an American with an amateurish interest in heraldry who stumbled upon your site, specifically your page on the Foster coat of arms. It might interest you to know that the depiction of the coat of arms from your geneaology book is almost identical to one used by the Gardiner family of Gardiners Island, New York. The family gained possession of that island in the 1600s and ruled it as “lords of the manor” until the Revolution. Their descendants still own the island today. 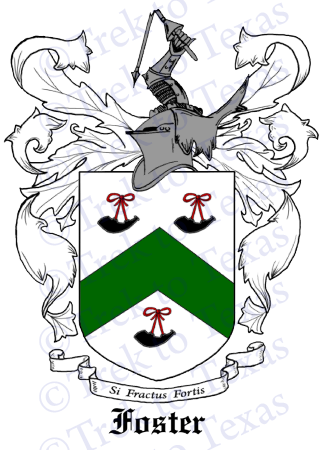 Their arms are identical to your ancestors’ in every way except the color: their chevron and buglehorns are gules (red) instead of the mix of green, black, and red depicted in your book. A decent picture of the arms is available in this book: http://books.google.com/books?vid=0IWtsUaV1d5lqR6jXs&id=08DdoryudvIC&pg=PA12&lpg=PA12&dq=The+Manor+of+Gardiners+Island#v=onepage&q=The%20Manor%20of%20Gardiners%20Island&f=false – on page 18. I don’t know what this means: it could indicate some relation to the Gardiners, or simple imitation. Finally, a possibly interesting tidbit: the “tilting helm” or “jousting helm” depicted on the arms in your book is the most common one in heraldry and generally indicates that the bearer is not of noble birth. An alternative is the “great helm”, that ominous soup-can-shaped helmet that brings to mind Crusaders. The “barred helm”, a round helmet with bars in front, usually implies nobility. Finally, a slight error in your drawing: the cloth surrounding the shield (sort of cascading from the top of the helm) is called the “mantling” and is most commonly colored to echo the shield. In your case it would probably be green on the outside, white on the lining (the lining is drawn with leaf-like veins in your depiction). Thanks for sharing your family history! Thank you for the great information! And thanks for the extra info that you emailed too. It’s all very interesting. I appreciate the additional info. I have a question about your family history as my Families history is very Vague. I am looking for Michal Foster. He would have been born around 1854 or so and married Nancy Robbins who would have been from Iowa. I can find NOTHING in regard to Michal. Does this name show up in your family back ground anywhere? Hello Douglas, I haven’t come across a Foster with that spelling (Michal instead of Michael) so far. Most of the Fosters that were traced in my family were from further south and west than Iowa. I do know some families traveled on to California after arriving in Texas, but where most of those families ended up after that is a mystery. I will keep an eye out for the names you mentioned and let you know. Thank you for commenting.